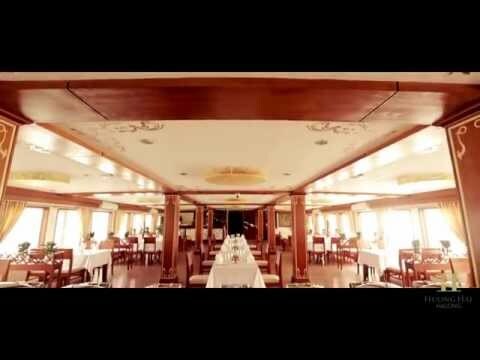 Huong Hai Sealife cruise but it was really the highlight of my Vietnam trip to Halong bay. I was amazed by the way they welcomed guests on board: just when the tender brought us to the Sealife cruise, the staff started playing rub-a-dub which made me feel like having joined the festival right on boat. It’s such a good feeling followed me throughout my journey. The room is very nice, decorated with big wall picture of some sea animals, the bathroom with ceramic basin. I like the private balcony where I relaxed and read the book “Vietnamese Cooking” I borrowed from Sealife library. The staffs: well done staffs. Huong Hai Sealife was cruising more in the afternoon getting to the place to sleep overnight. It’s absolutely quiet area. If you really want to get out of stress after all year working, highly recommend Huong Hai Sealife. I really enjoyed it all.